Home Minister Rajnath Singh is expected to move the Citizenship (Amendment) Bill in the Rajya Sabha on Tuesday, more than a month after it was passed by the Lok Sabha. The move comes as protests continue across states in the northeast and amid opposition from even BJP chief ministers. The move to table the Citizenship (Amendment) Bill has been interpreted as a sign of the Narendra Modi government's determination to push the legislation as the budget session of Parliament will end on February 13. The proposed law would grant citizenship to refugees from minority communities in Pakistan, Bangladesh and Afghanistan. On Monday, the chief ministers of two BJP-ruled states in the northeast met Singh to request him not to move the Citizenship (Amendment) Bill. Arunachal Pradesh's Pema Khandu and Manipur's N. Biren Singh apprised Singh of the protests across the northeast against the Modi government's plans to pass the Citizenship (Amendment) Bill. The two BJP chief ministers requested Singh not to pass the bill until people of the northeast were convinced that their cultural and linguistic identity would be protected. Meanwhile, on Monday night, the Manipur government imposed prohibitory orders in Imphal East and Imphal West districts till late night on Tuesday. The government cited agitations by various groups against the Citizenship (Amendment) Bill as the reason behind imposition of prohibitory orders. 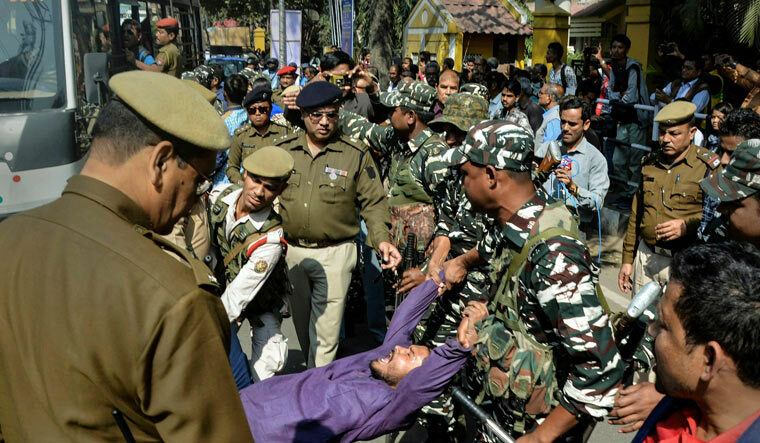 At least six people were injured on Sunday when police fired tear gas at protesters in Imphal. In Mizoram, security was tightened across the capital Aizawl and various towns and villages after the NGO Coordination Committee, the umbrella group spearheading protests against the Citizenship (Amendment) Bill, called for a 'black day' on Tuesday. All major political parties in Mizoram have announced opposition to the Citizenship (Amendment) Bill, with Chief Minister Zoramthanga announcing his Mizo National Front (MNF) would snap ties with the NDA. BJP Mizoram unit chief John V. Hluna even warned the state unit of the saffron party would be dissolved if the bill was passed.